Mares - Clarion Farm, Inc.
We believe that every successful breeding program has one thing in common- great mares! We have gathered some of the best mares available to us. They don't just look pretty, there are decades of sucessful genetics behind their pretty exteriors. We cross them selectively to the best stallions in the world to produce foals that not only have great conformation, movement, and jumping ability, but a wonderful temperament and superior rideability. We are proud of our mares and excited to share them with you! Hybritta MG is a beautiful brown filly born May 17, 2012 by Crespo VDL (Canturo x Cantillo) and is out of the great producing Majestic Gaits mare O'Bert-e-De Keur (Glenridge x Zuidhorn x Marco Polo) She has excellent conformation and breathtaking movement, but best of all she is extrememly smart and trainable. She learns easily and retains the information better than any young horse I have ever worked with. She comes from a long line of Ster/Keur Preferent mares her mother has produced a GOV Approved Stallion and many 1st Premium foals. Sire Crespo VDL (Canturo x Cantillo) was approved in 2010. A very very well developed stallion. At the public presentation of the stallions, the selection committee said that Crespo VDL proved himself very rideable and gave his riders a good feeling. He moved with abundant suppleness, closed his stride easily, and showed lots of scope. Crespo VDL brings strong jumping Holsteiner lines for breeding. Sire Canturo is an International Jumper at 1.6 meters. His achievements are impressive: Both 5 and 6 years old CANTURO competed in the finals of the German Young Horse Championships and at the age of 7 in the finals of the World Championships for Young Horses in Zangersheide. At the age of 8 he was victorious and placed in the CSI’s of Vienna, Rome, La Baule and the Swedish Derby in Falsterbo. At the age of 9 CANTURO was victorious in Spruce Meadows and nominated as a participant for the Olympic Games. The dam of Crespo VDL is a Regional Premium Holsteiner mare who comes from the Holsteiner stam line 474a which produces many approve stallions and international jumpers. Hybritta's dam Obertede is a Keur mare imported from Holland. She has produced both dressage and jumping foals that have done well at the KWPN inspections and breed shows including the approved Stallion Dante MG. O'Bert-e-de is by the keur stallion Glennridge who is deceased son of Wellington. Glennridge died young at 11 years old, and earned the Prestigious Keur predicate due to the quality of his offspring from even from a small number of foal crops. Glennridge won his stallion test with scores; walk 9 trot 7.5 canter 8 riding test 7 Free jumping 8.5 Show jumping 89.5 Cross country test 8 Character 8 Training report 8. Glennridge has a breeding value in jumping with the high score of 137! He was a Grand Prix jumping stallion who placed in numerous Grand Prix, World Cups and International Stallion competitions. In 1998 Glennridge was placed 12th in the World Rankings. He tragically died in 1999. O'bert-e-de's motherline is the Ritta mareline #15 in Holland. 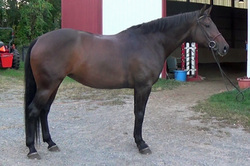 O'bert-e-de's dam Jorfa is a Keur mare who had the incredible high IBOP riding test score of 90! At 2 years old Jorfa was a UTV mare which is top honors for a mare in Holland indicating they are among the top mares in Holland. She comes from a long established line of Keur and Preferant mares. From this motherline is the approved stallions Triton, Zadok, Akteur, Zenner, Sportman, Theobalo and Zandor. Famous sires in her line include Zuidhorn, Amor, Marco Polo. Triton's granddam Geroma jumped at international levels. Triton's dam Lydia also produced the famous showjumper Nautilus who jumped the 1991 World Cup Finals. Cenieta is a lovely brown mare foaled 4/22/27. She was foaled in Holland and imported to the USA as a weanling. She is bred to perform and produce! She is a powerful mare with a great canter and strong hind end. She is a barn favorite and is one of those rare horses that is exactly the same wherever you take them. After taking her on consignment to sell, we fell in love with her and are excited to add her to our roster! She is sired by VDL Veron who was tragically deceased in 2008 at the age of 6 before he could make a large impact in sport and breeding. The sire of Veron is the Son of Quidam de Revel: Quite Easy, who is jumping at international level and comes out of the lines of Capitol and Vermont.. His dam, the ‘Keur’ mare Rinderella, has done an excellent mare test and her first 2 foals are now both approved stallions. Rinderella’s sire is Caretino, who has already produced a lot of horses who jump at international level, like Calandro and Caresino and approved sons like Casall and Caretello. The dam line has produced several approved stallions and S-jumpers. The full brother of Veron, Quinta Real is approved as a premium stallion for the Westfalen Studbook. Veron had a good stallion test and he has proven that he is an honest and reliable stallion to work with. He has received an 8 for scope. Veron won the stallion competition of Hengelo and was 5th in the total results. In all the qualification rounds he jumped with a lot of scope, elasticity and suppleness. In only a few crops, Veron produced a number of Elite Mares and many competition horses. We are lucky to have this mare in our barn as Veron mares are not easy to come by. Cenieta has a strong damline of Keur, Preferent, and Prestatie producing granddams. This mareline has produced the approved stallions Stuntman, Ulando H, VDL Windsor H, Unbelievable, Zakkenroller, Cover Story, and Well Done. It has also shown to be a very versatile line producing the 1.60m show jumpers Lindor, Phanieta, Viper H, Sonconco (full sibling of Cenieta's Dam), the FEI Dressage horses Courage, Kendall, and Anne Beth, and CCI1* horse Orlando. Damsire Olympic Concorde Keur Pref was an International competitor himself and the youngest stallion to be honored with the prestigious Preferent title. Concorde is sired by the incomparable Voltaire Keur Pref who has sired numerous hunter, jumper, and dressage champions. Proof of Voltaire's influence in the US show scene is that in 2014, 35 years after he foaled, Voltaire is still represented on the USEF Leading Sire Lists- Hunter #11 (son Popeye K is #2), Jumper #21 (sons Kannan #5, Concorde #18), and although he was a jumper he is still in the top 100 dressage sires!